I have been meaning to review this song for a while now. I heard it once and I was completely hooked. I guess it really took off after it was performed on The Voice, which makes sense since Christina Augilera is a coach on the reality-hit singing competition show. The song is just another one of Christina’s hits as a featured artist. The song originally didn’t have Christina, but she heard it and wanted in on it. I think the song wouldn’t sound as good without her wonderful voice dueting with A Great Big World’s lead singer, Ian Axel. “Say Something” is of course a break-up song. If you ever have heard the song you should be able to pick-up on that. The song is beautiful and is a little stronger brew than most break-up songs that you hear. I mean the main lyric is: “Say something, I’m giving up on you”. It is about someone finally breaking down and saying if you can’t talk to me or try to help fix this relationship, I’m going to have to leave. Of course it hits the emotions a little harder if you actually listen to the song. Listen to this brilliant song below! 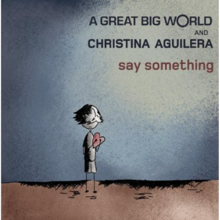 What are your thoughts on “Say Something’? If you wanna say something(clever, I know) about the song, go ahead and leave a comment in the comment section.